This is the home of Dr. Lee-o-netto. She moved to Allegany about 1915 and remained in this home until her death in December of 1939. It appears she stopped traveling her old routes about the time she settled here, but continued to work as an “Indian Doctress” until a year before her death. She situated her self right in the middle of town where she would be very easy for her clients to find. I suspect this was an intentional choice. I don’t yet know if she built the house or purchased it. The deed to this home was transferred to Gertrude Fowler just weeks before Lee-o-netto’s death. After a few years the Fowlers moved away. This house and the one next to it were torn down in the 1960s and a bank was built on the site. The row of buildings just beyond the two houses are still there. You can visit the neighborhood today by using Google Street View with the address 54 W Main, Allegany, NY. Or use this Google Map link and zoom in on either the Five Star Bank or the Allegany Town Assessor and have a look around. 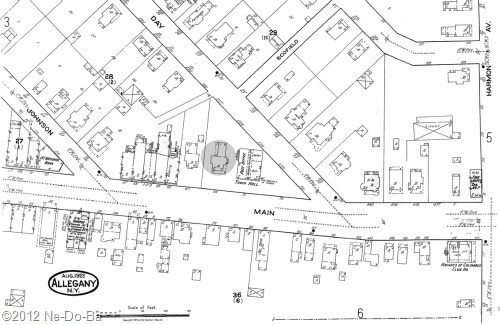 I love maps and the Sanborn Fire Maps are a great resource for home details. I acquired this one through the Library of Congress. The dashed line on her home indicates the roofed porches. She had a porch that wrapped around two sides of the house in front and another on the side in the back. The main house was two stories and the addition on the back has only one story. 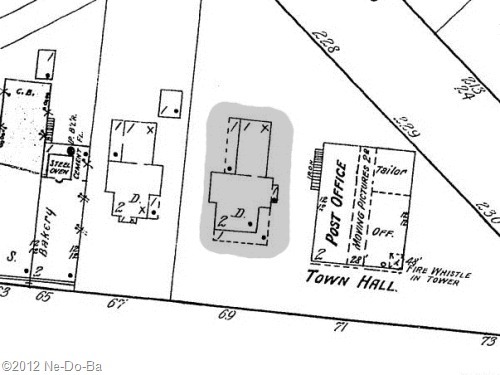 As you can see, the town hall is right next door, along with the post office, a tailor, and a “moving picture” theater on the second floor. Directories for the time period suggest the American Legion Post was also using the town hall. I bet she knew just about everyone in town and held all the local gossip while it was fresh. On the other side of the two houses is a bakery. Oh my, I can just imagine the wonderful aroma of fresh baked goods coming from the bakery each morning. I am still looking for additional photos of the home that might provide a look at the house from a better angle. I will be adding any I find to this post so they will all appear together. 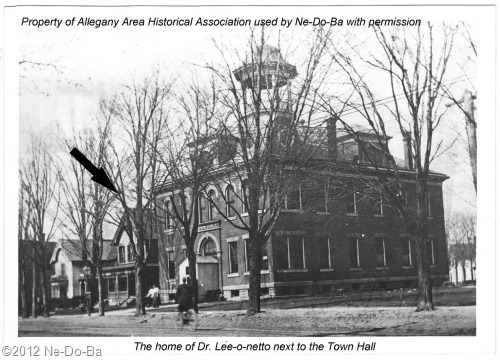 In a future post I will share a few personal memories about Dr. Lee-o-netto shared by her sister’s descendants along with items involving her that made the local news.